Hilda Legideño Vargas (left) holds a photo of her son, Jorge Antonio Tizapa Legideño, who was one of 43 student teachers who disappeared in Iguala, Mexico in September. She and student organizer Jorge Luis Clemente Balbuena (right) are travelling from Vancouver to Ottawa. Photo: Yolanda Cole. 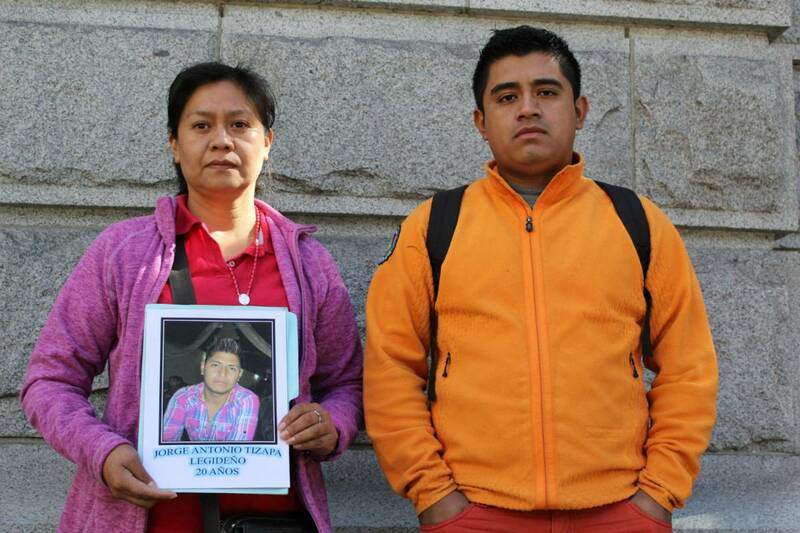 Ever since September 26 , Hilda Legideño Vargas has been looking for her son. Twenty-year-old Jorge Antonio Tizapa Legideño was one of 43 students from the Escuela Normal Rural de Ayotzinapa teachers’ college who disappeared on that date in the Mexican state of Guerrero. At first, the parents of the students looked in the local hospitals and jails—in any location they thought their children might be. They soon widened their search, and began to organize protests, calling on the Mexican government to look for the students. Now, they have taken their quest international, urging Canadian politicians, organizations, and citizens for support.